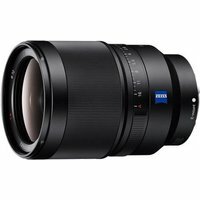 The Sony FE 35mm F1.4 35mm full-frame ZEISS Distagon lens is a great choice for landscapes, snapshots, portraiture, weddings, travel, lowlight photography and more. The bright f1.4 aperture allows you to gain more control over the depth of field and facilitates handheld shooting indoors in low light, as well as night scenes. The lens' 9-blade circular aperture design ensures a smooth background bokeh, which is often desirable for portraits. There's a whole spectrum of imagery that only a large f1.4 aperture can create. A minimum focusing distance of 30cm makes it useful for shooting images of flowers and similar subjects as well.